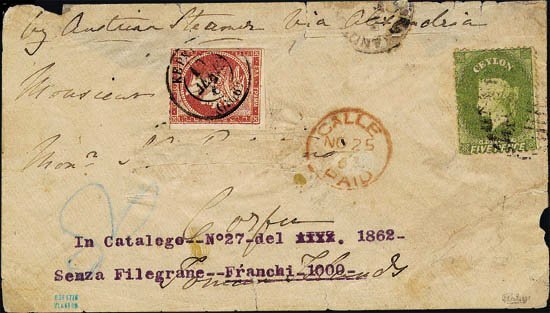 Cover (several faults) canc.GALLE*25 NO., franked 5pence olive-green QV CEYLON (wmk.Crown CC), trans.British ALEXANDRIA & Greek ΑΛΕΞΑΝΔΡΕΙΑ (ΤΟΥΡΚΙΑ), surtaxed with 80l.1862/7 Large Head on arrival canc.ΚΕΡΚΥΡΑ*10 ΔΕΚΕ.67. Addressee's name cut-out. The ONLY KNOWN Ceylon-Greece combination.HOLCOMBE certific. (1986) & OR.VLASTOS certific.(1989). A UNIQUE item.